January was Portland’s coldest winter since 1985, and the corresponding “snowpocalypse” left some areas with over 20 inches of snow. With winter just on the horizon, now is the time for property owners to understand their obligations and take steps to mitigate their risks in the case of a major ice or snow event this winter. While laws vary from state to state, in Oregon, the obligation to clear snowy and icy sidewalks and property access points rests solely on the home or property owner. This means the property owner can be held liable for anyone who slips or falls on snow- or ice-affected property. This risk increases dramatically if the property is an apartment complex, condominium or duplex. As a rental property owner, I’m concerned with protecting my investments from the legal repercussions of a preventable injury happening on my property and aim to mitigate such risks. Here are a few things you can do to protect your tenants and their guests from injury, and yourself from legal risk. First, review your standard lease. Does it have a clause that details the process of the responsibility of snow removal, and make it clear where the responsibility lies? Have a lawyer who specializes in real estate review the lease to be sure you’re protected. Second, consider consulting a good attorney to help you understand the laws in your area. Some cities have specific regulations regarding snow removal. The City of Bend requires all property owners to clear snow from sidewalks bordering their properties. This process must be completed within 24 hours in noncommercial areas and within six hours in commercial areas. Failure to follow the regulations can result in fines and penalties, not to mention potential injuries and insurance costs. Familiarize yourself with state, city, county and HOA regulations and you will remain out of trouble. Third, what’s your plan for removal? Do you intend to hire someone to do the removal, or do it yourself? What areas on the property are most prone to being unsafe? Surveying the property in advance of snow or ice will better prepare you for what to expect during winter conditions. Having an executable plan will also help in the event of inclement weather. Remember that if you hire a third party to clear the snow, they too will be busy and hampered by road conditions. Keep an eye on the clock to be sure you can meet your timely removal obligations. 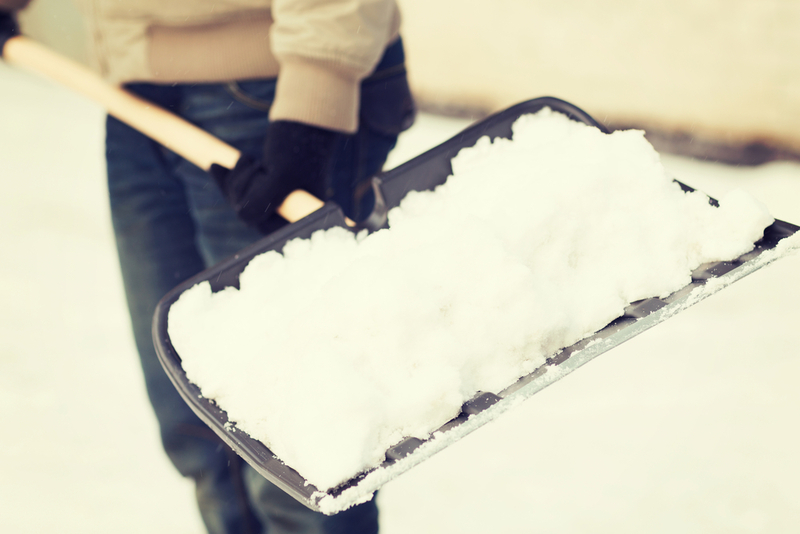 If you intend on doing the snow removal, consider and prepare for the dangers of the task. Overexertion, dehydration and frostbite can result from a lack of proper precautions. Layered clothing, frequent breaks and hydration are just a few safeguards for anyone removing snow to complete the process safely. While last year’s storm was unlike anything Portland has seen in decades, it’s possible this year’s winter may blow through with similar snow, ice and rain storms. The final step in preparing for winter is to be sure you have a solid insurance policy. Review your policy for coverage in the event of a winter weather injury. Get a handle on your worst-case scenario benefit; if your plan doesn’t offer the coverage you’d like—adjust it now. It will be one less thing for you to worry about when the first snowflakes fall. In Portland, the law requires an owner to clear sidewalks and driveways across pedestrian paths of snow and ice despite time limitations. The Portland Bureau of Transportation (PBOT) recommends creating a three-foot-wide path. They also suggest posting advisory signs for the potential of falling snow or ice. Their website also states that owners are required to clear away any snow berms left in driveways and entrances by city snow plows, and to pile it away from the street and public rights-of-way. USI helps companies and individuals with comprehensive employee benefits solutions, commercial insurance and risk management consulting, retirement plan services, executive benefits and personal risk services. Contact us for a consultation at 503.224.8390 or online at USI.com to see how we can help. Ted Stark is Senior Vice President at USI in Portland. He also owns and manages three rental properties. He can be reached at Ted.Stark@usi.com or 503-295-9399.